Making your High Holiday plans? We are pleased to announce that we will, G-d Willing, once again be offering High Holiday Services as well as our famous Community Dinners for the upcoming High Holidays! Do you feel like you harbor a deep desire to visit Israel and take it all in? To go on a trip to your ancestral homeland like never before? A guided, fun, luxurious journey, together with old friends and new, that will leave you with memories that you will cherish forever? The fast day of Tisha B'av begins this Saturday before sunset and ends Sunday night at nightfall. Service on Saturday night -- The traditional melodious reading of the Book of Eicha (Lamentations). 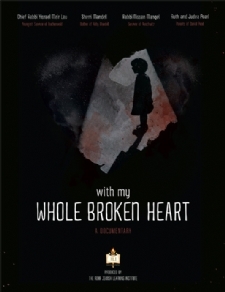 Film on Sunday afternoon -- My Whole Broken Heart, featuring interviews and discussion on finding a positive response in the face of tragedy and destruction. The first nine days of the month of Av (starting from this Friday, July 17) are days of acute mourning for the destruction of the first and second Holy Temples. Among other observances, during this time we refrain from eating meat or drinking wine (except on Shabbat), swimming or bathing for pleasure, remodeling or expanding a home and buying new clothes. The Fast of Tisha B'Av begins next Saturday, July 25 at 8:18 pm and concludes Sunday, July 26 at 8:43 pm (times local to the Clear Lake area). Join us for the customary melodious reading of Eicha (the Book of Lamentations), Saturday, July 25, 9:15 to 9:45 pm. At the home of Rabbi Yitzchok and Malky Schmukler in League City. For more about the history, insights and observances of the Nine Days and the Fast of Tisha B'Av, visit www.JBayArea.org/3weeks. Join us for a special Tisha B'Av event featuring the exclusive screening of a documentary film and discussion. The film features interviews with Ruth and Judea Pearl, parents of WSJ reporter Daniel Pearl; Sherri Mandel, mother of Kobi Mandell; Rabbi Nissan Mangel and former Israeli Chief Rabbi Yisrael Meir Lau. Only one week left to submit your date dedication or ad for next year's Bay Area Jewish Calendar. Act soon to join in! Ads start as low as $99! Questions? Contact our office by replying to this email or calling 713-398-2460. This Sunday, July 5th, is the 17 Tammuz fast day, on which we refrain from eating and drinking from dawn to nightfall. It also marks the start of a period known as "The Three Weeks." The Three Weeks is an annual mourning period that falls out in the summer, when we mourn the destruction of the Holy Temple and the beginging of our exile.